Transition Your Home from Summer to Fall with These Easy Tips! It’s September, and I am officially OVER the horrible, hideous heat of Summer 2016. To be honest, I was done with it in July, so the slog through August has been nearly unbearable. Never mind the fact that the fall season doesn’t officially start until the 22nd, and there are likely several days near 90 degrees in future forecasts. No one thinks of September as a “summer” month, so I deem the 1st as entirely acceptable to begin dragging out garlands of autumn leaves and rust colored sofa pillows. I’ve been planning and shopping for fall decorating pieces for weeks. Just keep the Jack O’ Lanterns and overtly Halloween-y items tucked away until October 1st, and even the worst festive naysayers (husbands who balk at new door wreaths) will stay off your back. I always return to three guidelines when planning for fall decorating. They can encompass many color combinations and themes, so don’t feel you have to be stuck with red, orange, and yellow leaves with pumpkins and scarecrows on a stick! 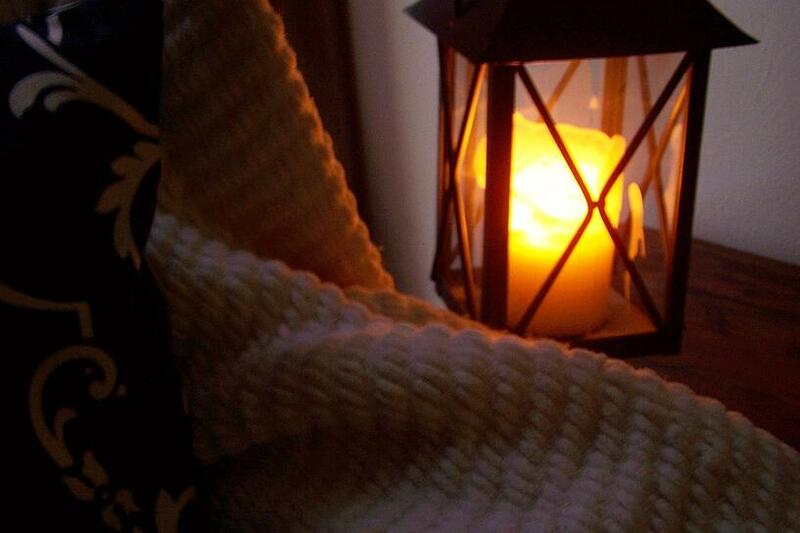 Reading a dictionary definition of autumn, it mentions that blankets, couches, and fireplaces are mandatory to celebrate the season. Not really, but the cooling temperatures make us all want to huddle and cuddle. Swap summer linens and use a heavy hand when adding in warm tones in soft fabrics: throw blankets, pillows, and couch slipcovers. Jewel stone colors like amethyst, sapphire, and emerald work for the fall too and make a great segueway into the winter season, as do neutral beiges and cream colors. Fall scents, whether warm and spicy or sweet and fruity set the mood as soon as you walk through the door. There are plenty of ways to buy scents from candles to wall plugs, but maybe this year, try a homemade variety. No doubt nature’s colors and textures are two of the best parts of fall. Take advantage of their abundance and free price tag! 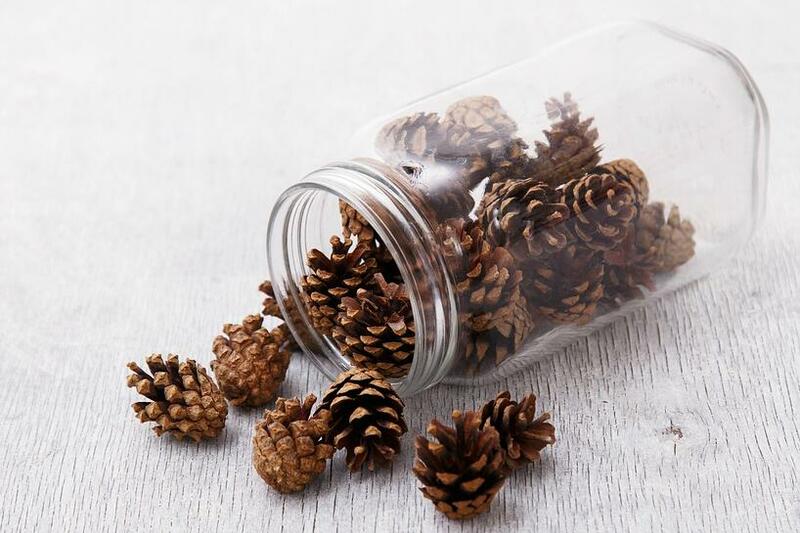 Filling glass containers with acorns, pine cones, and leaves of all shades make for interesting coffee table tops and mantels. A stack of birch wood is beautiful in non-working fireplaces. Grocery store gourds and Indian corn are easily arranged for dining room table centerpieces using baskets and cake plates you already have. RELATED: 3 MONTHS OF FALL HOME DECOR MADE EASY! 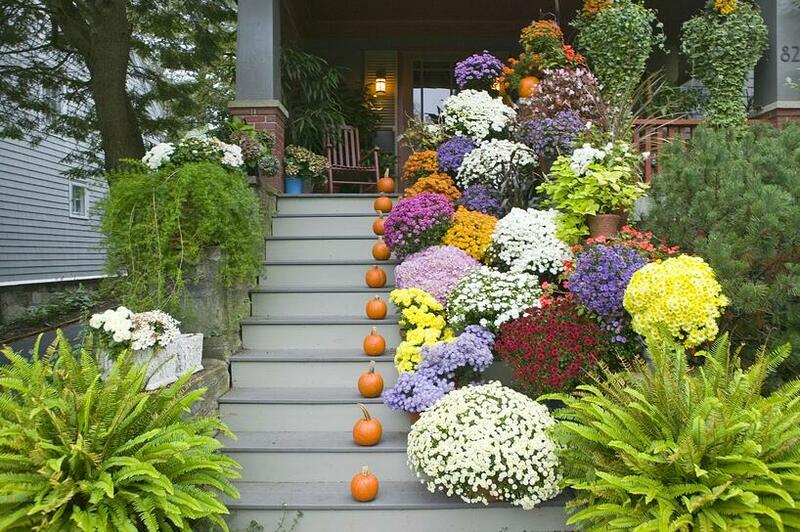 Small or large, porches are probably the easiest to turn into fall, and later Halloween, scenes. Cornstalks on pillars, stacks of white, green, or orange pumpkins, and hay bales all have their place, but adding unexpected touches like hanging lanterns or potted plants in punched tin planters add charm. Use porch furniture like chairs and benches to hang wreaths and show off hearty mums. If the garage is a prominent feature, go ahead and deck out the light fixtures and add wreaths to the stationary part of the door. I have to confess. I started fall-ifying my front porch August 31st, so my back-to-school kid could walk home and see a happy harvest scene each day. You see, it’s all for the kids. Really! 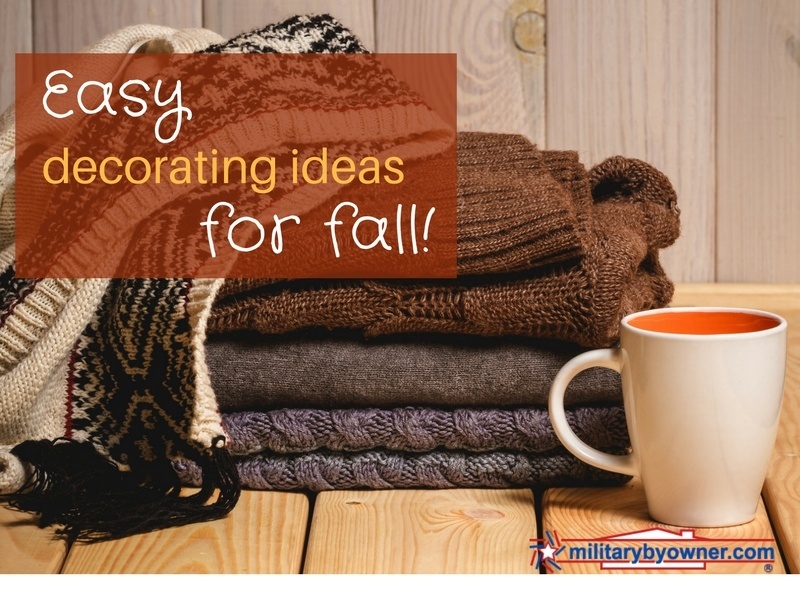 If you need more fall inspiration, MilitarybyOwner has several season related decorating blogs to reference and enjoy. 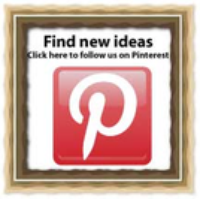 And for even more home decorating ideas, be sure to follow us on Pinterest!